Harry Johnson, the „DEAN“ of Bartenders, published this original manual about 1860. This complete guide for mixing drinks and running a successful bar was the authoritative manual when drinking was an art. The prices shown in this revised edition are Harry’s own – out of date to be sure – the recipes, however, we vouch for. Some brands mentioned are now not obtainable – substitute modern brands. Wines, Liquors, Ales, Mixtures, etc., etc. Charles E. Graham & Co. In submitting this manual to the public, I crave indulgence for making a few remarks in regard to myself. The profession – for such it must be admitted – of mixing drinks was learned by me, in San Francisco, and, since then, I have had forty years’ experience. Leaving California, in 1868, I opened, in Chicago, what was generally recognized to be the largest and finest establishment of the kind in this country. But the colfagration of 1871 caused me a loss of $100,000 and, financially ruined, I was compelled to start life anew. It was at this time that I was taught the value of true friendship, for numerous acquaintances tendered me material assistance, which was, however, gratefully declined. Though later engaged in Boston, at a leading hotel, I soon returned to New York and was employed in one of the well-known hostelries of the Metropolis until enabled to begin a business of my own, which has since been pre-eminenty successful. There was published by me, in San Francisco, the first Bartenders’ Manual ever issued in the United States. This publication was a virtual necessity – the result of a constant demand for such a treatise by those everywhere engaged in the hotel, bar and restaurant business. As a proof, ten thousand (10,000) copies of the work were sold at a price much larger than the present cost within the brief period of six weeks. in 1869, I was challenged by five of the most popular and scientific bartenders of the day to engage in a tourney of skill, at New Orleans, with the sequence that to me was awarded the championship of the United States. To recapitulate: - Having been in the hotel and liquor business, in various capacities, since my boyhood, being employed in some of the most prominent hotels, restaurants and cafés of several large cities, and having traveled extensively in this and other countries – especially of Continental Europe – for the sole purpose of learning the methods of preparing the many different kinds of mixed drinks, with the highest letters of recommendation acknowledging my thorough ability, I have, after careful preparation with much time and expense, succeeded in compiling this work which is now offered in a revised and up-to-date form. There is described and illustrated, in plain language, the popular mixed concoctions, fancy beverages, cocktails, punches, juleps, etc. 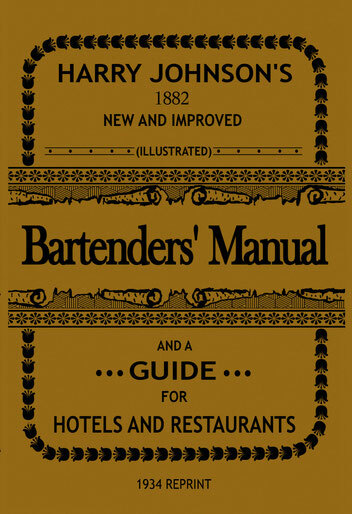 This volume also furnishes comprehensive instructions to be observed in attending a bar, in personal conduct, how to serve and wait on customers, and all the various details connected with the business so definitely stated that any person contemplating starting in life as a bartender has a perfect and valuable guide to aid him in a complete mastery of his line of labor. This manual likewise gives a complete list of all bar utensils, glass and silver ware, mixtures, liquors, and different brands of beverages that will be required, with directions for their proper use. There is, additionally, a large number of valuable hints and items of information for bartenders and, in fact, every detail that may be of importance from the moment one steps behind the bar through all the requirements of each day succeeding. Those who are thoroughly experienced, and whose competence has long since been conceded, have also found this work to be of value to them. They have always acknowledged it to be “a handy volume”. The principle I desire to instill is that this vocation – that of eating and drinking – to be properly successful, must be conducted by the same legitimate methods as any other monied enterprise that appeals directly to the public. It furnishes a necessity, just as does the clothier, hatter, and shoe-dealer, and, in itself, is an honorable means of livelihood. It should not be regarded by the proprietor or employee as a special means of securing the patronage of friends, as a possible avenue of good luck or as a chance to gain by nefarious opportunities. It should be managed alone in an earnest, honorable manner. Believe in yourself and others will have faith in you. The writer has also made – for many years past – a profession to teaching the art of attending a bar to any one expressing an inclination to learn. In the great number of those who have received instruction from me in the latest methods and scientific manipulation, I can with pride refer as testimonial of my fitness as a teacher of bartending. In conclusion, I desire to state that this publication, in its first edition, was the primary work of the kind in the United States, if not in the world; and that I am the originator of a form of manual instruction that may be classified as a contribution to trade literature. 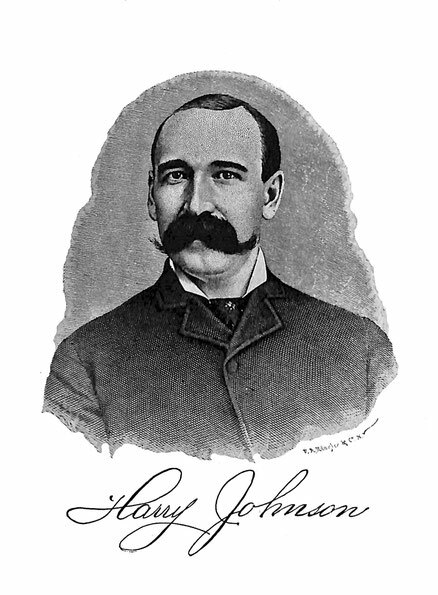 Imitation is always the sincerest form of flattery and, consequently, attempts have been made to furnish the public with similar efforts by others – efforts that have failed to detract from the popularity and efficiency of Harry Johnson’s Bartender’s Manual. But it is to be noted that this volume is not alone intended as a guide to those serving at the bar. Its purpose is to be a work of reference, as well, for the proprietors of hotels, restaurants, clubs, steamship lines, public dining-rooms and all those engaged in catering to the general needs of “the inner man”. It is my hope that this guide will not only prove serviceable to the profession, for whom it is specifically intended, but, furthermore, to the family circle and the public in general. The style and art of mixing is indicated in the twenty odd illustrations that are given in the work, special attention being called to plates Nos. 1 and 3. Plate No. 2 is, likewise, pertinent to the text. LIST OF UTENSILS, WINES, LIQUORS AND PRINCIPAL STOCK OF RESTAURANT AND CAFÉ. 1. HOW TO ATTEND A BAR. The General Appearance of the Bartender, and How He Should Conduct Himself at All Times When on Duty. The author of this work has, after careful deliberation, compiled the following rules for the management of a saloon, and would suggest the advisability of following these instructions while attending a bar. He has endeavored to the best of his ability to state them in perfectly plain and straightforward language, as the work must be conducted in the same systematic and proper manner as any other business. When waiting on customers, at any time, it is of the highest importance for a bartender to be strictly polite and attentive in his behavior and, especially, in his manner of speech, giving prompt answers to all questions as far as lies in his power; he should be cheerful and have a bright countenance. It is absolutely necessary to be neat, clean, and tidy in dress, as that will be more to the interest of the bartender than any other matter. He should be pleasant and cheerful with every one, as that will not only be gratifying to customers, but also prove advantageous to the bartender serving them. It is proper, when a person steps up to the bar, for a bartender to set before him a glass of ice-water, and then, in a courteous manner, find out what he may desire. If mixed drinks should be called for, it is the bartender’s duty to mix and prepare them above the counter and allow the customers to see the operation; they should be prepared in such a neat, quick and scientific way as to draw attention. It is also the bartender’s duty to see that everything used with the drinks is perfectly clean and that the glasses are bright and polished. When the customer has finished and left the bar, the bartender should clean the counter well and thoroughly, so that it will have a good, renewed appearance, and, if time allows the bartender to do so, he should clean, in a perfect manner, at once, the glasses that have been used, so as to have them ready again when needed. Regarding the bench which is an important feature in managing a bar properly, it is the bartender’s special duty to have it cleared up and in good shape, at all times, for it will always be to his advantage if done correctly (see illustration, plate No. 2.). Other particular points are the style of serving and the saving of time. Whenever you have to mix drinks which require straining into a separate fancy glass, such as cocktails, sours, fizzes, etc., make it a rule to place the glass of ice-water in front of the customer, next to it the glass into which you intend to strain the drink, and then go to work an mix the drink required; try to place your glassware on the counter all in one row or straight line. As to the personal style of the bartender, he should stand straight, carry his head erect and place himself in a fine position (see illustrations, plates Nos. 1 and 3.). 2. HOW A BARTENDER MAY OBTAIN A SITUATION. When a bartender is looking for a position or an opening, it is of great importance for him to present a neat, clean appearance. It is also proper for him, as soon as he approaches the proprietor, to be careful in his speech and expressions, not say too much, but wait until the prospective employer asks him questions to which he should reply promptly. Have good recommendations with you, if possible, or, at least, be able to prove by references that you are reliable and capable. In entering an office or restaurant, it is proper to take off your hat and, especially, while talking to the proprietor – a much-neglected act of courtesy. Many people believe that they lower themselves by lifting their hats, but this is a mistaken opinion, as it is only a matter of etiquette and shows proper respect. When the proprietor is a gentleman, you will find he will do the same, even before you have; perhaps, to show that he has the proper knowledge of what etiquette demands. A bartender inquiring for a position should be clean-shaven, with clothes well-brushed and shoes blacked; and should not speak to the proprietor with a cigar in his mouth and neither should he spit on the floor, be chewing a toothpick, use slang or profane language or indulge in other bad habits. All his answers should be short and in a polite tone of language. When the question of wages is introduced, you must know yourself what you are worth and every good bartender should demand good wages. Of course, it’s much better to demand the proper salary, at once, than to accept small wages at the beginning and then attempt to have it increased later, as this method generally creates an ill-feeling between employer and employee, especially if the desired “raise” is refused. It is advisable for the bartender to ask the proprietor or manager, in a gentlemanly manner, what hours he is to work, whether by day or night, whether entitled to meals or not, what privileges are to be given him, what is demanded of him and obtain information of all the particular rules and regulation governing the place of business. If everything is satisfactory to both and you have been engaged, at once leave the place, in a proper manner and do not linger about, trying to occupy the proprietor’s time more than necessary and not give the bartender, who is going to leave or to be discharged, an opportunity to know what the business talk has been, or stop and chat to any possible acquaintance, who may be present, about what you are going to do. I try to impress on every bartender’s mind that he should study his business as much as possible, in every way, so that he be entitled to the highest salary paid; for I do not believe in cheap bartenders. It is much better for the proprietor to pay high wages to those fully understanding their business than to hire “shoemakers” who have but little if any knowledge of the business. Cheap men, as a rule, are worthless. 3. THE MUTUAL RELATIONS OF EMPLOYER AND EMPLOYEE. It is important that the proprietor of a hotel, restaurant or saloon should try his best to get good help, the best to be obtained in his line of business, for the reason that the more skilled assistance he has in his employ, the easier it is to conduct the business, and the more successful he will be. After having secured a good set of employees, it is the proprietor’s duty to pay them well, every one according to his position; treat them all with politeness and set a g good example by his own manner for them. For example: - When the proprietor enters his place of business in the morning, or at any other time, he should salute his people properly by bidding them the time of day, saluting with a pleasant nod and create a genial feeling among them all by approaching and speaking to some one or more of them, calling them by name, as he may address them casually or on business. By doing this, he will create good feeling between the help and himself and even in his absence his employees will do their work correctly and promptly. But, otherwise, by not treating them kindly, it cannot be expected that the help will take any particular interest in the business or do more than is absolutely necessary to retain their situations. This indifference will naturally be detrimental to the business of the place. It is plainly apparent that when the help are not treated right, the proprietor acting harshly or with an overbearing manner, never having a “good word” for anyone, lacking the commonest politeness of even saying “good morning!” he will fail to make a success; for his employees, instead of caring for his interests, will be antagonistic to him, caring little whether his business runs down or not. The fact is, that employers and employees, should be in harmony with one another, in every direction, the proprietor looking upon his help as friends, regarding them with a family feeling, while they should have the proper respect for him as an authorized boss, but with no fear and, certainly, with no idea of treating him familiarly. It is a sensible idea for the proprietor, from time to time, when doing a very successful business, to give his employees a little inducement in the shape of a raise of wages, proportionate to their different positions. This will cause them to strive more earnestly to benefit the business, and thereby benefit themselves. It is well also to be prompt in letting the employees go at the hour designated and not detain them unless they are to be paid extra. The employees, too, are to be just as precise in going to work at the exact minute specified. There should be a perfect system of working hours, the time of which is not to be disregarded by either party. If the proprietor is particularly successful and making plenty of money, it is advisable to give also an occasional extra holiday, in proper proportion, providing the help is worthy of it from long and earnest service, or, if possible, in the summer season, to let the employees have, at different times, a brief vacation, though this is naturally a difficult matter in our line of business. When the proprietor sees the time is fit to reward anyone of the employees, to tender an extra present to some particular one, he should, if financially able, privately put a five or ten-dollar bill in the man’s hands without any comment, and without letting others see the action. There should not be any self-praise – such an action brings its own reward – and, in this case, it is not well to let the left hand know what the right hand is doing. By such means, you will keep your good, faithful people with you and be sure they are working to the best of their ability. Where the proprietor is not in the position of being able to reward financially his employees, a pleasant look, cheery words, and friendly actions will go far with those who can appreciate and take, to some extent, at least, the place of a money gift. If the proprietor is successful, he should not display a pride of his own rise and imagine it’s all the result of his own brilliant mind, claiming entire credit for his financial progress, but acknowledge his indebtedness to his help, for without their assistance he would not have made such rapid advance on the ladder of success. Give encouragement to your help, but do not let them understand that it is by their efforts alone your business has prospered; for, if you flatter them too much, you can easily spoil the best of men in your employ. Never be bombastic or domineering, at any rate. It is very vulgar to be purse-proud. It is wise, under certain circumstances, to supply your help with meals and, when it is practicable, it should be seen that the employees have good, substantial food, well cooked and properly served and not have refuse or “leavings” given them, caring little when and how they get it. It is not necessary to furnish them with delicacies and luxuries, but food that will keep one in strength and proper physical condition, to the lowest as well as to the highest assistant in your employ. It is wise for the proprietor or manager to state the regulations of the house when hiring the help, insisting that they should be clean, energetic, sober, drink only a certain amount at meal time or between meals, as standard rules are more beneficial in their results and will retain people much longer in their situations than where there are no regulations and everyone is allowed to do more or less, as they please. After all the facts mentioned and noting suggestions offered, it will be found that they will give satisfaction to both, the one hiring and to those who hire out. The proprietor is to remember that here the golden rule, “Do unto others, as you wish them to do to you”, is of paramount importance. In a large concern, where much help is employed, make it a rule that what are known as “officers” (the bartenders, cashier, assistant cashier, manager, headwaiter, etc.) are to be allowed to order from the bill of fare (where there is a restaurant attached) when they eat and specify in your rules a certain amount they are entitled to order in value, perhaps from 40 to 60 cents in price. When this is not done, many employees will ruin their stomachs and, consequently, their health by over-feeding and also create a bad feeling among themselves as well as with the other help, by taking special delicacies; the result being that the proprietor is ultimately forced to make the rule he should have had at first and thus makes it very unpleasant for all the employees. It is absolutely necessary for the proprietor to protect his people from insults or wrongful accusations by the customers. It is often the case when a patron is a little intoxicated, he may think he has the privilege of calling the employees any sort of a name, but it is then the proprietor’s duty to step in and call the man to order. If the waiter is accused of wrong-doing, it is the proprietor’s place to ascertain which one of the two is in error, and if he finds out the employee is in the right, he must defend and support him, at any risk, careless of what the results may be to himself. It is also the proprietor’s or manager’s duty to see that the “officers” eat properly, conduct themselves quietly, especially if in the public dining-room, so the guests will not be annoyed by any exhibition of bad or vulgar table manners. The boss should look after these matters with the same care he would supervise the control of his own family. It is not the intention of declaring absolutely that any and every proprietor should do as I have written, but, naturally, use his own judgment in connection with these suggestions. 4. RULES FOR BARTENDERS IN ENTERING ON AND GOING OFF DUTY. 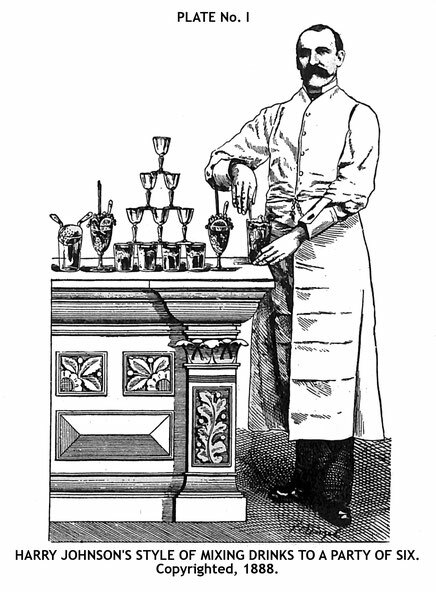 When the stipulated time arrives for a bartender to quit, it is his duty to see that his bench is in perfect order, that all his bottles are filled, that his ice-box has sufficient ice in it, that all glassware is clean and everything straightened out in such a manner that when his relief arrives the latter will have no difficulty, and can immediately commence to serve customers. When the relief takes charge, it is his duty to convince himself that nothing has been neglected, such as stock filled, bar stock replaced, empty bottles removed and the proper pressure given to the beers, whether water, air or carbonated pressure. Sufficient fruit should also be cut up ready for use and everything properly arranged to enable him to perform his duty satisfactorily. Where there is no cheque system, the cash must be properly arranged, also. This is generally done by the proprietor or the one having the management, so that there will be no difficulty in regard to the condition of the cash drawer, which is a most important point in business. 5. FIRST DUTY IN OPENING A BAR-ROOM IN THE MORNING. The greatest attraction of a bar-room is its general appearance. The first thing a bartender should do is to open the place, every morning, promptly, on the minute, at the hour it is understood the salon begins business. First give the place a perfect ventilation and immediately after prepare your ice-water ready to meet the first demand. Put the porter to work, have him properly clean up the bar-room and water-closet floors without unnecessary rising of dust. After the floor is cleaned, have all the cabinet work, counter, cigar case, ice boxes, ceiling, chandeliers and globes (when necessary) cleaned and dust thoroughly, the glasses and mirrors polished and the windows washed. But only a moist sponge should be used on the fine cabinet woods which are then to be dried gently with a towel. The use of a great amount of water will injure the panels of wood-work especially. The silverware and glassware should be in perfect condition, clean towels supplied to closets, and napkins, towels, “wipers” and hand-towels to the bar. Then, turn your attention to the bottles containing liquors, mixtures, etc. ; see that they are filled and corked and those required for ready use placed on ice. Go to work on your bench, place all the glassware on top of the counter, but use as little space as possible, to give yourself plenty of room to wait on customers who might come in at that time. Next, give the bench a thorough scrubbing or washing and, afterward, wash your glassware well in clean water and place those that belong there back on the bench. After having your bar and all bottles cleaned and polished, see that your wines and liquors are cool and pleasant and in a proper condition. Have the ice boxes on the bench filled with fine-broken ice and stored with the necessary goods. Cut up the fruits – oranges, pineapples, berries, and lemon-peel for cocktails – that may be needed during the day. The bartender should have this part of his work done as quickly as possible and make his appearance behind the bar, neat and clean, as soon as his work permits him, not looking half-dressed, in his shirt-sleeves and in a general untidy appearance that is likely to drive away customers.